Here's Pyxis bundled up for winter '98. I used the same cheap blue poly tarp as last year but this time I clamped it to the rub rail with some wooden clamps I made. I did this to keep the tarp off the topsides. Last year dirt got trapped under the tarp and was ground into the topsides. It took a lot of hard work to get it out. This new method for securing the tarp will keep that from happening. We also did a wax job after haulout. We did not cover for the '96 winter. That spring the boat was cleaner then it had ever been. It seems like the cover traps dirt. 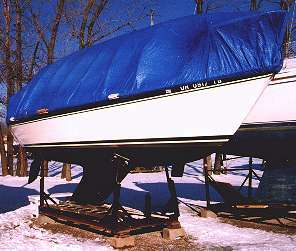 My reason for covering is to keep water off the boat when there are freeze/thaw cycles and to keep large amounts of snow off the boat (it can stress the hull where it sits on the pads).